Tempe, Arizona enjoys around 330 days of sunshine a year, more than anywhere else in the country. Its picturesque landscape in the Sonoran Desert is also highlighted by a fantastic southwestern culinary scene. Hayden Butte and Tempe Town Lake offer outdoor activities right in downtown Tempe. You can also take fantastic day trips to Sedona, the Apache Trail, or even closer, to nearby Papago Park and South Mountain Park. Just 4 miles from Phoenix Sky Harbor International Airport, Tempe is easily accessible. A light rail system connects Tempe with the airport and Phoenix, so you don’t even have to rent a car if you don’t want to drive. A winter visit to Arizona makes for an excellent reprieve from cold weather climates. Tempe is home to Arizona State University, one of the largest schools in the USA. Art enthusiasts can pop into the ASU Art Museum to see impressive pieces by artists like Viola Fey. Downtown Tempe is packed with a wide variety of bars and restaurants and is especially lively on Friday and Saturday nights. You’ll discover an excellent culinary scene at restaurants like House of Tricks, Culinary Dropout, NCounter, Top of the Rock, Singh Meadows and Ghost Ranch. You can also rent electric boats, kayaks and pedal boats for a relaxing time on Tempe Town Lake. Arizona’s unique landscape is a major selling point for visitors. The state might be most famous for the Grand Canyon, but you don’t have to travel far for a nice hike. 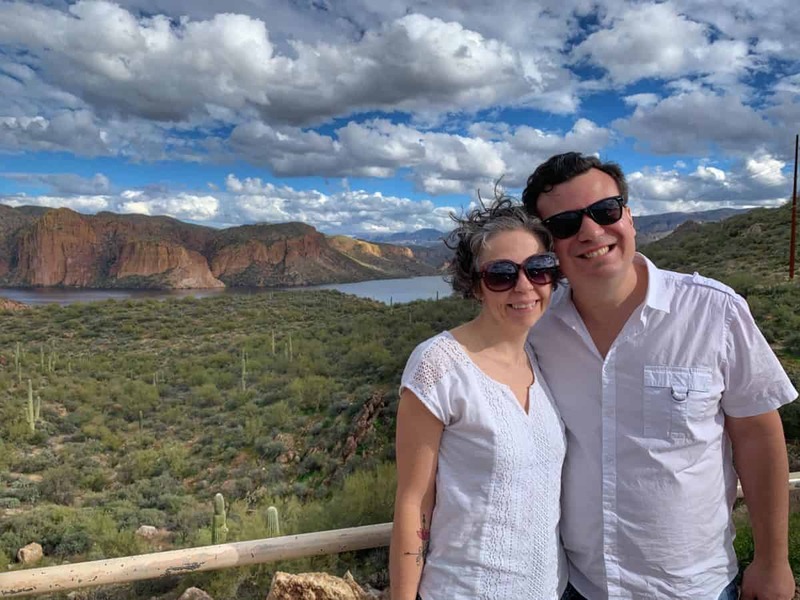 We loved that Hayden Butte (commonly known as ‘A Mountain’ among locals) was right across the street from our beautiful downtown Tempe hotel, Tempe Mission Palms, which you could see from its picturesque pool deck. Our first morning, after a delicious breakfast of fluffy red velvet waffles at NCounter (voted best waffles in Arizona by Food Network), we enjoyed the half-mile hike up Hayden Butte. Hayden Butte is dotted with cacti and even features petroglyph rock drawings from previous native civilizations. From the top, you’re rewarded with a picturesque view of Tempe, Phoenix and the surrounding mountains. Our second day in Tempe, we embarked on a day trip to Sedona with Detours American West. Detours is based in Tempe and they pick up guests directly from their Phoenix, Tempe and Scottsdale hotels and resorts. Detours also offer a few other day tours, including the Grand Canyon, Apache Trail, Antelope Canyon and Horseshoe Bend, Tombstone and more. They also offer multi-day tours to Monument Valley and Zion National Park. Bell and I were inspired to visit Sedona based on so many incredible Instagram posts we had seen. And it’s less time in the van compared to going to the Grand Canyon. A couple days later we drove the Apache Trail and found it to be just as beautiful as Sedona. So wherever you choose to go in this region, you’re going to see amazing natural beauty. We were surprised and impressed with the Chapel of the Holy Cross, which has stunning views overlooking Sedona. Due to the government shutdown, we were not able to visit Montezuma Castle National Monument, which is one of the best-preserved Sinagua cliff dwellings in North America, dating back around 1,000 years. Instead, we visited the old copper mining town of Jerome. Because of the small group size, we enjoyed chatting with other people on our tour including some fellow residents of the DC area and even a lady visiting from Australia. We had two free hours in the town of Sedona. Our guide Steve, who was wonderfully knowledgable and accommodating, gave our small tour group several recommendations for where to eat. We decided to try his recommendation for local southwest dishes at Cowboy Club (and we noticed Steve eating there himself). We ordered cactus fries, rattlesnake and boar sausage and bison chili. While the cactus fries and rattlesnake sausage were interesting, the best dish we ate there was the bison chili. Detours American West Sedona Red Rocks Tour starts at $139 US per person. Pickup time from area hotels is between 6am-7am and tours return around 6pm. Art enthusiasts should visit the ASU Art Museum in Tempe. Part of the Herberger Institute for Design and Arts and the New American University, ASU Art Museum is internationally recognized as a leader in contemporary art. The museum focuses on Latin American art and has the largest collection of Cuban art in the United States. The architecture of ASU Art Museum is really interesting, as visitors are welcomed by two large cowboy boots outside the front entrance. We especially enjoyed the beautiful work of Viola Fey there. ASU Art Museum: Admission is always free. Hours: Tuesday – Saturday 11am – 5pm. Open to 8pm on Thursday. Closed Sundays, Mondays and university holidays. We saw a lot of impressive and unusual things during our trip to Arizona. One of them was Electric Desert at the Desert Botanical Garden. The nighttime desert comes alive in a dazzling display of lights and music. In some of the displays, the lights on the cacti resemble coral on the ocean floor. In other displays, cacti appear to dance in the night. The mountain display was also captivating. The only downside was that the temperature dropped significantly that night into the high 40’s Fahrenheit (around 8-9 Celsius) and we forgot to bring our jackets. So check the forecast and bring a jacket if the temperatures drop significantly (common at night in the desert). We jumped in an Uber to Desert Botanical Garden from Tempe Mission Palms, which only cost us around $8 each way. We had dinner at Gertrude’s at the Desert Botanical Garden and really enjoyed our dinner. Gertrude’s showcases local ingredients and dishes from around Arizona and the southwest. Both the wild boar in green chili and vegan grits were excellent dishes. We also really enjoyed the sweet beets cheesecake, made with goat cheese and beets. If you like beets, it’s a unique dessert to try! Our server was on point and asked whether we liked beets when we asked for her dessert recommendations. Sunday – Wednesday | 8 a.m. – 10 p.m.
Thursday – Saturday | 8 a.m. – 11 p.m.
We stayed at two different places over five nights in Tempe. We stayed the first three nights at Tempe Mission Palms, which was a 2018 Conde Nast Traveler Reader’s Choice Award Winner. It’s a comfortable, quiet and picturesque stay right in the heart of downtown Tempe. We then picked up a rental car and stayed two nights at the Phoenix Marriott Resort Tempe at The Buttes, which is 4.5 miles outside downtown Tempe. We enjoyed our stays at both, and it depends what you’re looking for as to which hotel we’d recommend over the other. Tempe Mission Palms is located in the heart of downtown Tempe, just off Mill Avenue. So it’s especially handy for visitors who want to be within walking distance from great restaurants, fun bars, shops and activities. Rooms are comfortable, and we loved the view of their beautiful palm tree filled courtyard. Their rooftop pool with a picturesque view of Hayden Butte is another lovely highlight. There’s also quality onsite dining at two restaurants, Harry’s Place and The Mission Grille. Tempe Mission Palms also offers free shuttle service from Phoenix Sky Harbor Airport. The Phoenix Marriott Resort Tempe at The Buttes is great for a relaxing or romantic urban getaway. The hotel features multiple dining options two pools, with a waterfall cascading from the picturesque butte it’s built into. You can get a massage or facial at the on-site spa, which is great to relax or as a gift for a special occasion. There’s also tennis courts and gentle hiking trails to help stay fit during your vacation. There’s even an indoor waterfall and Japanese koi pond in the dining room of the Market Cafe, where we enjoyed a tasty breakfast with a beautiful view overlooking Tempe. You can also dine and drink poolside at Thirsty Cactus Pool Bar and Grill (which we didn’t get a chance to try). There’s also a Starbucks on the property. The Phoenix Marriott Resort Tempe at The Buttes is unique because there’s picturesque hiking trails right on the property. You can enjoy different varieties of cacti with scenic views. You could relax there for a few days without leaving the property. But when you do want to leave, there’s a lot of great options a short drive away. We really enjoyed dinner at the Marriot’s on-site restaurant, Top of the Rock. Top of the Rock has great panoramic views of Tempe and the surrounding area. The pork tenderloin with rutabaga, rye berry and nasturtium was really tender and flavorful, and one of the best pork dishes I’ve eaten. Bell had the smoked sesame tofu with heirloom beans, boy chow and cashew crema, which was also very good. The dining room is elegant, and our server was really friendly. She even asked at the beginning of dinner if we were celebrating a special occasion. We were not, but we appreciated that she asked because that’s rare. We loved the delicious southwest culinary scene in Tempe. There’s a lot of great restaurants serving up creative dishes, using local ingredients that are a treat for those outside the region. There’s plenty for foodies to try in Tempe. And with ASU in town, there’s some fun places serving quality dishes too. We really enjoyed lunch at House of Tricks, which is housed inside two homes that date back to the 1920’s, right in downtown Tempe. From the name, you might expect a magic show. But it’s named after the last name of the husband and wife team that opened one of Tempe’s first fine dining restaurants back in 1987. So they don’t perform actual tricks, but the quality of the food is almost magic. We highly recommend the pan seared red trout with toasted almonds, mushroom brown rice and seasonal vegetables. Culinary Dropout is the funnest restaurant we ate at in Tempe, and we really enjoyed the food and drinks also. On the Saturday night we visited, there was a great band and a mixed crowd of all ages. It’s a popular spot for ASU students, as well as anyone looking for good food and drinks, in a fun atmosphere. As is often the case when Bell and I eat out, we split a meat and vegetarian dish for a balanced diet (and it’s also helpful for reviews). The spicy vegan curry at Culinary Dropout is tasty and interesting. It’s a dish of griddled sweet potato, eggplant, snap peas, cauliflower, shiitake mushrooms and black rice. And their pub burger is really good too, topped with Havarti cheese, bacon and BBQ sauce. We appreciated that Culinary Dropout has a nice selection of local beers, ciders and other drinks. For something different, try their “AZ Prickly Pear Cider” on draft, which Bell enjoyed. I really enjoyed Four Peaks’ “Daisy May Hopped Saison,” which is a nicely balanced local beer. I also tried Papago Brewings’ “Orange Blossom Ale,” but found it a little sweet and preferred the saison. The staff are happy to offer samples of anything on draft, so just ask them before ordering! Their drink menu also features quality selections from around the world, but we prefer to try local products when traveling. If you visit Culinary Dropout for dinner on a weekend especially, make a reservation if you don’t want to wait. We just rocked up and as the wait for a table was long, we decided to eat at the bar. For a treat of inventive southwest cuisine, head to Ghost Ranch. Reflecting the multicultural history of the region and the iconic red rocks, their modern menu and decor are a fusion of southwest cultures and beyond. We really enjoyed the ceviche, enchiladas and plato vegano. As someone who struggles with lactose intolerance, I especially appreciated the plato vegano, which is a dish of coconut cilantro cream, Sonoran wheat berries, chipotle cashew cream and seasonal vegetables. Dessert was also very good and inventive, with ice cream atop a spicy chocolate cake with cocoa nibs. Ghost Ranch is 4 miles south of downtown Tempe, and especially worthwhile if you have a car in the area. Their kitchen is adventurous with food, but doesn’t go overboard. So it’s a great spot for foodie couples who want to try some interesting dishes, and it makes for a nice casual date night. We highly recommend grabbing breakfast at NCounter in downtown Tempe. Bell has a gluten allergy and she loved their delicious red velvet waffles, which are also gluten-free. They were perfectly fluffy, tasted like red velvet cake, and not something that is gluten-free, even though they’re made with rice flour. They’ve been voted best waffles in Arizona by Food Network too. I also recommend the chilaquiles, which are fresh corn tortillas lightly fried, topped with roasted ranchero sauce, melted cheese and two fried eggs. It’s a real southwest delight of a breakfast. Singh Meadows is a real surprise and treat. It is a meadow hidden away, and on our first attempt to get there we completely missed the turn. There is an organic market with a generous selection of free samples, cafe and a beautiful meadow. At the market you can pick up fresh produce, honey, jams and other goods. Their cafe serves up delicious food, coffee and fresh juices. You can take food and drinks out to the meadow and enjoy them on available seating or picnic blankets they supply. All the ingredients were fresh and tasted fantastic. At Singh Meadows, we really enjoyed the Thai Curry Bowl with market vegetables, basmati rice, herb salad, toasted coconut and cashews. The jerk chicken tacos with apple slaw, harissa aioli, cilantro and spicy roasted sweet potatoes was also delicious. We also had a delicious beet juice and a pot of French press coffee. This is a beautiful and romantic spot for a picnic. If you stay in downtown Tempe, you don’t need a rental car for the days you don’t plan to leave Tempe. You can even conveniently visit Phoenix via the light rail. We spent our first three days in the area without a rental car, as I’m a big fan of not driving if I don’t have to. We utilized both the Uber and Lyft apps, and also the local Grid Bikes system. There are 30 Grid Bikes docking stations around Tempe, and over 100 stations in the Phoenix, Tempe and Mesa area. There’s a docking station near City Hall, which is just a block from Tempe Mission Palms. Just download the Social Bicycles App. A couple of nice places to bike are around Tempe Town Lake and the campus of Arizona State University. Just watch for the pedestrian-only signs around the ASU campus though. We missed the sign and were told by campus security that we needed to dismount our bikes and walk them. You can also go for a hike up nearby South Mountain Park and Preserve, which is right on the edge of Tempe and Phoenix. With over 16,000 acres and 51 miles of trails, it’s one of the largest parks in the country. Go for a hike, bike ride or just drive up to the top of the mountain for a fantastic view overlooking the area. Unfortunately, we were running tight on time and didn’t quite make it to the top before having to return the rental car at the airport. But we enjoyed all the tall saguaro and other cacti on a little hike near the visitor center. Check out Tempe City Hall as the inverted pyramid structure, built in 1970, is one of several surprising aspects of a visit to Tempe. It’s as if a sun god designed a pyramid, then became angry and threw it, and it landed upside down in the Sonoran Desert. The actual architects were Michael Goodwin and Kemper Goodwin. We fell in love with the Apache Trail drive on the last full day of our 5 day Arizona trip. The drive begins at Apache Junction, and the paved portion concludes just past the old western town of Tortilla Flat. The winding road through the Superstition Mountains, dotted with tall saguaro cacti, takes you through Tonto National Forest, featuring picturesque Canyon Lake. Another worthwhile stop on the Apache Trail is Superstition Mountain Museum. Also known as Apacheland Movie Ranch, the former movie studio for western films is now a museum. One of several highlights there is the church where Charro! starring Elvis Presley was shot. On Thursday afternoons there are free lectures, and during the week and weekends, a variety of classes are offered, including desert safety and survival class or gardening in Arizona class. We didn’t get a chance to attend any of these, but if we go back we’d like to check one of them out. In Tortilla Flat, be sure to visit the Superstition Restaurant and Saloon, if available, grab seats on their horse saddle bar stools. If you enjoy spicy chili, be sure to order some. We both remarked that it’s one of the best chili’s we’ve ever eaten. If you’re driving and don’t want to drink alcohol, try a sarsaparilla, which is basically root beer. The walls are covered with $1 bills signed by previous patrons. It’s an all around quirky throwback of a place. Tortilla Flat has a tiny historical museum, packed with over 100 years of history, including some movie memorabilia. We even saw real scorpion suckers in the country store. I asked the shop attendant if the scorpions were edible and she said they were because the stingers have been removed. She continued “now I’m not sure you would want to eat them though!” A much safer and delicious bet would be to get a scoop of prickly pear gelato ice cream there. We enjoyed everything that was prickly pear flavored during our trip to Arizona. So be sure to try that in a drink, ice cream, or candy. And we certainly look forward to thawing out again soon! Disclosure: Tempe Tourism sponsored our trip to cover the area, but all opinions and photos included in this article are our own. A big thanks to Toni Smith for organizing our trip as it was a pleasure to cover this beautiful region! Wow – this is a really thorough, detailed, and helpful review of Tempe, Arizona’s highlights. I loved reading this post and am definitely bookmarking it for future trip planning! But first – I need to fix myself a plate of something to eat, because I worked up quite an appetite just reading about all the delicious dishes you had around town. Thank you for sharing your experience! Thank you, we really enjoyed exploring Tempe! It was such a change in landscape from the east coast! And the food scene was great – lots of fresh ingredients in all the food we ate, with wonderful options for those with food allergies and dietary restrictions. 330 days of sunshine a year! As someone who used to live in upstate NY, I am jealous! Also, the food in the south is of a different kind all together as evident once again from all your pictures. You mentioned the entry fees for the Botanical Gardens and I can’t help wondering aren’t they a bit steep? The electric one does look very cool though. Tortilla Flat (the name though !) looks straight out of a post card. Super detailed guide, thank you! Yes, that amount of sunshine is amazing, we lived in Dublin for a few years and the lack of sunshine was the hardest thing about living there. So the fee is high for Botanical Gardens, but the light display was amazing and must have taken the people putting it together many hours and love and the gardens are beautiful with huge cacti. However, we recognize that this cost excludes those with lower means and that is really unfortunate. Thank you! We enjoyed our trip there and warmer weather! On our header, no we did not create the header, we worked with Betsy at Wanderlust Designer. She is a wonderful artist and does a really great job of asking the right question to get you what you want! The bison chili was good! We recommend trying it if you get to Sedona 😀 Happy travels! Wow, I never realized there are so many interesting things to do in Arizona. The Desert Botanical Garden looks just amazing – I’d love to visit it. And all those things you ate – yummy. You lead with 330 days of sunshine a year and I’m sold! I always wanted to visit Arizona. The cowboy club seems awesome! I’ll add that to my list if I go. Arizona is so visually stunning so you’ll love it when you go! The Cowboy Club has a nice view of the Red Rocks around Sedona from its patio, and country music playing in the background gives it a real slice of Americana feel. I love a well detailed and informative post, and this one is certainly on of them. Arizona never really popped up on our travel calendar, but actually why not. Beautiful botanical garden!!! Thanks for the compliment! You’ll really enjoy Arizona when you visit someday! Arizonans tend to be friendly and laid back too, which adds to the experience. I love to visit botanic gardens when I travel and yoy description of the Desert Harden sounds magical especially the light and music show at night. Being a jacket is a great tip. What a great guide for a place I knew little about. 330 days of sunshine sounds right up my husband’s street. The different foods you enjoyed all sound amazing and there’s definitely plenty to do around Tempe! So glad you learned a lot about Tempe and Arizona from this article, Cath! Yes so many great reasons to visit, especially in the winter if you live in a cold climate. Happy travels! Great post! Arizona has been on my bucket list for several years! The nature there just looks so different and spectacular! And now I know that I have to add Tempe to that list! Glad to hear you’ve added Tempe to your bucket list, Mike! It’s a fun town with a great culinary scene to enjoy while you discover more of the amazing natural beauty in Arizona. Hope you get there soon! Happy travels! Great inspirational post! Now I can’t tell for sure what attract me most: contemporary art museum or 330 sunny days… lol Or Electric desert?.. Seem I have a new place to put on my “must-see places” list! Glad we’ve inspired you to visit Tempe and Arizona, Anna! There’s indeed a lot of cool things to check out on a visit! Looks like such a fun trip! I would love to explore Arizona one day and visit Tempe! Besides all that delicious-looking food, what looks most interesting to me is the Electric Desert. I’d love to see something similar in cacti greenhouses from nearby botanical gardens. It’s a wonderful show! The first time we’ve seen something like that. Yeah, it would be great to see a show like that elsewhere as well!